“Life’s 2 Short 4 Just 1 Sport” is more than a catchy tag-line, it is the basis for everything we believe in at 2•4•1 Sports. We believe we are meant to be at play year-long and life-long. We want to honor the days when “just be home by dark” was pronounced every afternoon by parents living in neighborhoods like ours. The past two decades of youth athletics have transformed sports from playing a game to planning your future. We live in an era of fear and exclusivity. Children’s play is now controlled by adults. Kids no longer know how to organize a pick-up game of any sport. Young athletes (and their parents) believe they must choose one sport and that is the only sport. Too many are under the impression that the only way to play professionally, collegiately or even in high school is to play that one sport – year round – and only that sport. Elite, Premier, AAU, ODP, … and the list goes on of excluding, self-promoting programs that too often send the wrong message to kids who are at critical stages in their physical and emotional development. 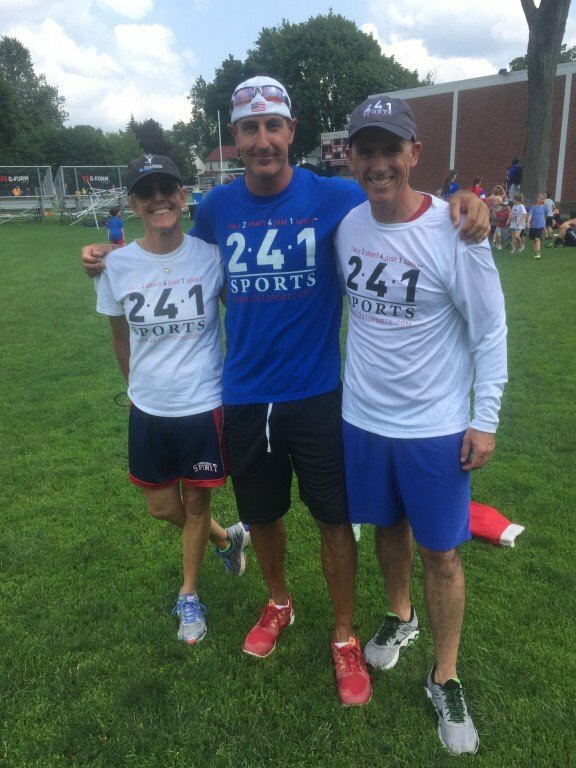 2•4•1 Sports, all of our staff not only believe in the value of multi-sport participation – we live it. We know from personal experience, that there are multiple advantages to playing multiple sports: reduced injuries, reduced burnout, increased speed and quickness, increased competitiveness and yes, an increase in production and appreciation of your favorite sport. It’s OK to have a favorite just not an only! We look forward to discussing our philosophy with anyone and hope you will come and share the 2•4•1 experience. 2•4•1 Sports Founder and CEO Steve Boyle took part in spreading the message of Sport Sampling and Physical Literacy along side First Lady Michelle Obama. The First Lady’s message was clearly aligned with what has been Steve’s life work regarding play and good nutrition. In her speech Mrs. Obama shared, "We're not developing our next generation of kids and competitors..." She and her brother Craig (a former Division 1 Basketball Coach now with the NY Knicks organization) went on to share their joy of playing multiple sports growing up in Chicago. Letter of support from U.S. 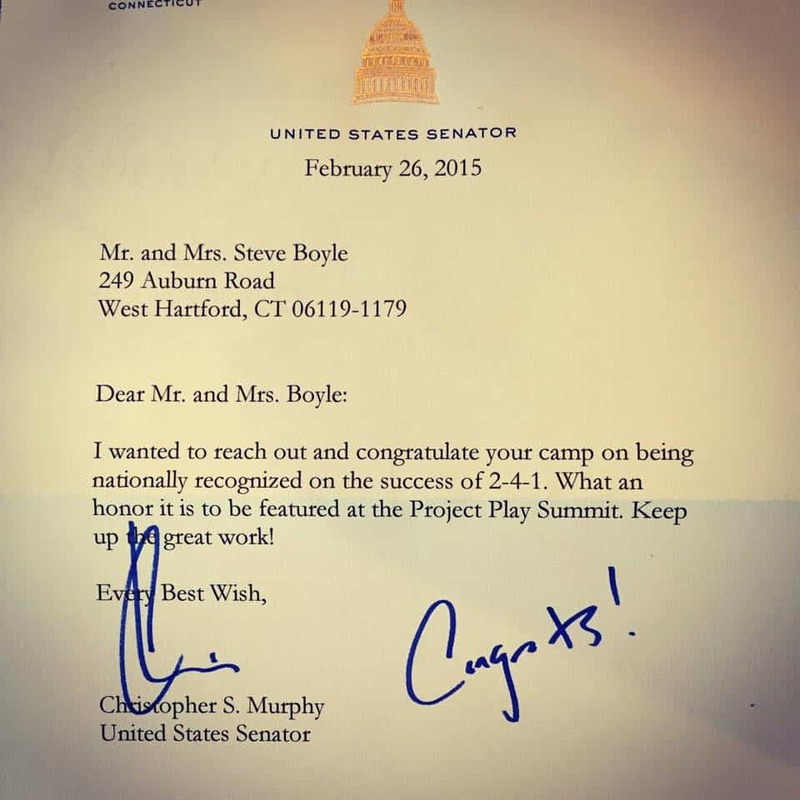 Senator, Chris Murphy. NBC’s Kevin Nathan shows why “Life’s 2 Short 4 Just 1 Sport”. Click HERE to hear Steve with Emily Cohen out of California on The Team Snap Podcast.